This guidance covers requesting extracts, certified copies and plain copies of documents from the land register, along with evidential status and authentication. Extracts and certified copies carry the evidential status necessary for court purposes. We also provide plain copies of documents in our registers. Plain copies contain the same information as extracts and certified copies, but they do not carry the same evidential status. of, or of any part of, a document in the archive record. of, or of any part of, any other document in that record. The Registers of Scotland (Information and Access) Order 2014 (the Information and Access Order) made under section 107(1) also provides that a person may request a “plain copy” of certain documents, including those listed above. A plain copy is essentially a copy of the same information available as an extract or a certified copy but without evidential status. The provision of plain copies will replace the existing quick copy service. An extract or certified copy issued under section 104(1)(a) or (b) or (2)(a) above is to be accepted for all purposes as sufficient evidence of the original, as sufficient evidence of the contents of the document as submitted to the Keeper, and of any matter relating to the original which appears on the extract or copy. This means that an extract and certified copy of any of the documents listed above will carry the evidential status required for court purposes. This is a progression from the position under the 1979 Act when a person could apply to the Keeper for an "office copy", but only of a title sheet or documents referred to in a title sheet. Plain copies are available to offer customers a quicker and cheaper alternative to extracts or certified copies where copies with evidential status are not required. The provision of land and charge certificates is discontinued under the 2012 Act, However, the Keeper is under a duty to notify both the applicant and granter of the deed (or their agents) upon acceptance on to the register i.e. when registration is completed. As part of that notification the Keeper will provide applicants with a PDF version of the updated title sheet and the relevant part of the cadastral map. The Keeper appreciates that applicants will want to check that their application has been given effect to correctly at the end of the registration process and the PDF should be sufficient for this purpose: it is a snapshot taken from the register with, in effect, the same status as a view from ScotLIS. Find out more about our notification duties. A request form for extracts, certified copies and plain copies is available on the Registers of Scotland website. Use of this form is not mandatory, and a person applying for an extract or copies may request it by letter, email or in person at one of our offices. However, use of the form is encouraged to help ensure that the relevant information is included with any request. The title sheet record and the cadastral map are separate parts of the register under section 2, and as such section 104(1) contains a separate provision for extracts of the title sheet, and for extracts of the cadastral map. This means that a request for an extract of the title sheet will not automatically include the corresponding part of the cadastral map. However, the Keeper is aware that in most cases the person applying will wish to see both title sheet and map together, and in terms of the Registers of Scotland (Fees) Order 2014 (the Fees Order), a combined single product will be available. The Fees Order sets the fee for an extract or certified copy at £30 plus VAT and the fee for a plain copy at £16 plus VAT. Where a request is received for an extract of a title sheet the Keeper will update the title sheet to the most recent date appropriate. Where there are no pending applications the Keeper will update the title sheet to the previous working day or, if there are pending applications, to the day before the earliest application. A person may request an extract of a title sheet as at a specific date, meaning a past version of a title sheet could be requested. This may be useful where, for instance, a person has been sequestrated and the trustee in sequestration wants to know what that person owned prior to sequestration. However, the Keeper is only under an obligation to provide such an extract where it is reasonably practicable to do so, and will depend on how comprehensive the material contained in the Keeper's existing archive is, and the complexity of the request or title history. However, copies of the deeds contained in the archive will be available as an alternative. Under section 10(3) the Keeper may "incorporate by reference" in a title sheet a document in the archive record or a deed in any other register under the management or control of the Keeper or of the Keeper of the Records of Scotland, which includes documents recorded in the Register of Sasines or registered in the Books of Council and Session. This allows the Keeper to replace the existing "copy in certificate" practice from the designated day. In line with existing practice incorporation by reference will only be used in certain circumstances; namely, where it is not practical or expedient to make an entry in the title sheet for the deed in question. When a person requests an extract or plain copy of a title sheet where a deed has been incorporated by reference, a copy of that deed will be included as part of the extract or plain copy for no additional fee. Under the 2012 Act an area of land owned in common constitutes a separate plot of land for the purposes of registration, and the Keeper must make up a separate title sheet for it. There is separate guidance on shared and sharing plots, however for the purpose of extracts and plain copies it is important to note that when a request is received for an extract or plain copy of a sharing title sheet, the Keeper will also provide an extract or plain copy of any associated shared plot title sheets, for no additional fee. Where a person seeks to request an extract or plain copy of part of the cadastral map this will be limited to one cadastral unit per extract or copy. A cadastral unit represents a single registered plot of land. This is provided for at article 3 of the Information and Access Order. The provision of one cadastral unit at a time is due to the way the current mapping IT systems work: the data for each title is structured so that when an individual title is examined not only its legal boundaries are displayed but also references both within and outwith those boundaries. 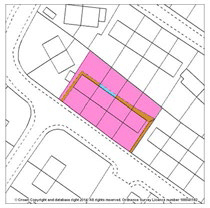 By virtue of section 12(2) cadastral units cannot overlap, however where two or more registered plots have reciprocal rights and burdens these must be shown on the respective cadastral units. If both cadastral units were displayed together the tints and hatches relating to those rights and burdens will overlap and become obscured by those reciprocal references. This means that paper extracts of more than one cadastral unit would be inaccurate in many instances. View a worked example in Annex A. Since extracts and plain copies will be issued on paper (at least for the foreseeable future) any copy containing a part of the cadastral map with more than one cadastral unit could become legally inaccurate. If the information contained in such an extract or plain copy were then relied upon the Keeper could be liable to pay compensation in respect of any loss suffered as a consequence in terms of section 106(1). The archive record becomes a statutory part of the register for the first time under section 2(c), and it will be possible to obtain an extract that is acceptable for court purposes of a document in the statutory archive record. View separate guidance on the archive record. The Keeper can authenticate an extract or certified copy as she considers appropriate in terms of section 104(6). The Keeper will authenticate an extract by applying the existing Land Register seal to each page of the document. Certified copies will be authenticated by a handwritten docket signed and dated by a member of the Keeper's staff added to the last page of the copy. "This extract has been issued in terms of section 104(3) of the Land Registration etc. (Scotland) Act 2012 and shall be accepted for all purposes as sufficient evidence of the contents of the original, and of any matter relating to the original which appears on the extract in terms of section 105(1) of that Act." "This extract has been issued in terms of section 104(3) of the Land Registration etc. (Scotland) Act 2012 and shall be accepted for all purposes as sufficient evidence of the contents of the document as submitted to the Keeper, and of any matter relating to the document as so submitted which appears on the extract in terms of section 105(2) of that Act." "This certified copy has been issued in terms of section 104(3) of the Land Registration etc. (Scotland) Act 2012 and shall be accepted for all purposes as sufficient evidence of the contents of the original, and of any matter relating to the original which appears on the copy in terms of section 105(1) of that Act." "This certified copy has been issued in terms of section 104(3) of the Land Registration etc. (Scotland) Act 2012 and shall be accepted for all purposes as sufficient evidence of the contents of the document as submitted to the Keeper, and of any matter relating to the document as so submitted which appears on the copy in terms of section 105(2) of that Act." In terms of section 104(7) the Keeper may issue an extract or certified copy as an electronic document if requested. However, the courts do not currently have the capacity to receive extracts or certified copies electronically. If the Keeper were to apply a digital signature to such documents as authentication it would be of no practical utility since the person relying upon the electronic extract or certified copy would have to print it off in order to present it in court. Once printed off the document becomes a mere copy of the original and would therefore lose its evidential status. For that reason, the Keeper will not issue extracts or certified copies electronically until such time as the courts can receive them electronically. Until then, if a person requires an extract or certified copy a paper version will be provided. The Keeper will provide plain copies electronically where requested. In terms of paragraph 13 of schedule 4, any application for registration received before the designated day, but completed after the designated day, will be registered under the 1979 Act provisions. Therefore land and charge certificates will continue to be issued in respect of such cases. The archive record becomes a statutory part of the register under section 2(c), and paragraph 12 of schedule 4 specifies the documents from the pre-designated day archive that are to migrate to the statutory archive record from that day. This means that it will be possible to request an extract of such a document or information. such other information, in whatever form, as so relates, in so far as those copy documents, and as the case may be that other information, is held by the Keeper immediately before the designated day. However, whilst there are statutory provisions to govern what the archive record should consist of post-designated day, there were no set rules to govern the types of documents and information that could previously be archived. Therefore, for the avoidance of doubt, any document appearing in the existing non-statutory archive, which has not migrated to the statutory archive record, does not fall within the scope of paragraph 12, and extracts of such documents will not be available. As previously mentioned, section 14(3) provides that the Keeper need not include in the statutory archive any document comprised in another register under the management and control of the Keeper or the Keeper of the Records of Scotland. Paragraph 12 is subject to this provision therefore any previously archived death certificate or other document held in another register, does not become part of the statutory archive, and cannot be extracted under section 104(1)(c). The Keeper will issue extracts of single cadastral units from the cadastral map due to the way the current mapping IT systems work: the data for each title is structured so that when an individual title is examined not only its legal boundaries are displayed but also references both within and outwith those boundaries. The route of the servitude is defined on the cadastral map for its full length for each cadastral unit: however, when looking at an individual title the references reflect the legal position in relation to the servitude: for the part of the servitude benefiting an individual title it is coloured blue and for the part burdening the individual title, it is coloured brown. As can be seen, the relationships between burdened and benefited parts of the servitude for each property become unclear and are technically legally inaccurate, notwithstanding that a likely view could be taken.